Corral-Wodiska & Cia., successor to a partnership established in 1905 together with Antonio Fernandez and Edward Wodiska known as Fernandez, Wodiska y Corral , began producing Bering cigars in 1905 at their first factory building at 2612 14th Street on the corner with Michigan (Columbus) Avenue. They remaind there until 1928 when they moved to this building at 1302 N 19th Street factory where they operated until the 1980s. 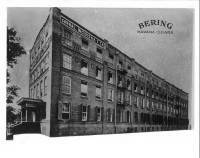 “Bering”, Corral-Wodiska's best known brand of cigars, can still be seen at the top on the side of the building. In 1985, Corral, Wodiska & Ca. was bought by Swisher International, Inc. maker of Swisher Sweets who consolidated its manufacturing processes and sent Bering cigar production to Honduras, where they are still manufactured to this day. 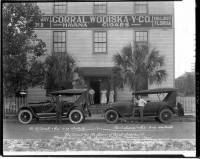 Manuel "Manny" Corral (1870-1938), a Spanish immigrant who had moved to Tampa in 1905, had acquired the interests of Fernandez and Wodiska becoming the main shareholder of Corral-Wodiska & Ca. Edward Wodiska (1858-1937), who had previously been a talent agent in New York City, had developed a reputation as an outstanding salesman working for several other cigar concerns including Arguelles, Lopez & Bros., the Ruy Lopez Co., and Ryan & Raphael Cigar Co. Francisco Sierra (1863-1948) left Asturias, Spain as a young teenager and learned the cigar business in Cuba. After moving to Tampa in 1907 he married Maria, the oldest of the six daughters of Manuel Corral. His production knowledge together with Wodiska's distribution talent were the original engines driving the creation and success of Corral-Wodiska & Ca. Their first cigar brands were Bering and “ Julia Marlow ”, a beautiful and famous New York actress and friend of Mr. Wodiska. In 1924, Francisco Sierra broke away from Corral-Wodiska & Ca. and acquired the Salvador Rodriguez operation and the Charles the Great Cigar Factory building. This 67,485 square foot 4-story factory at 1302 N 19th Street was built according to Hillsborough County records in 1916, which information appears to be in error. Other sources state it was built in 1908 for the Portland, Oregon based firm Esberg-Gunst Cigar Company who remained here for only two years. It was then occupied by the Alto Cigar Company between 1910-1912, by the M. A. Gunst Co. between 1913-1917, the General Cigar Company in 1918 and then F. Arango & Co. between 1919-1922 during which time workers nicknamed the factory “La Trocha". The Corral-Wodiska factory building underwent a complete rehabilitation in accordance with the Historic Guidelines established by the Federal Government and is currently a multi-tenant professional office building.